Stellaris is a 4X grand strategy video game developed and published by Paradox Interactive. Stellaris's gameplay revolves around space exploration, managing an empire, diplomacy, and space warfare with other spacefaring civilizations. It was released worldwide for Windows, OS X, and Linux on May 9, 2016, and was released on February 26, 2019 for PlayStation 4 and Xbox One. Stellaris is a real-time grand strategy game set in space, beginning in the year 2200. Players take control of a species in its early stages of interstellar space exploration, right after the invention of faster-than-light (FTL) spaceship technology, ready to claim a place as one of "the species of the stars". Depending on several factors, such as the ethics of the civilization and the player's desires, the ultimate goal of the empire can range from galactic conquest, hoarding of resources and technological supremacy, to the peaceful coexistence or absolute destruction of all sentient life. The player controls ships, including science, construction and military vessels. Combat includes space combat and ground combat and is more centered towards the bigger picture, preparation, and strategy. There are also diplomatic options such as alliances and trade agreements with other races. The game begins either by picking one of the premade empires, using a random one determined by the game and only revealed when the game starts or by creating a species., The process involves picking a mixture of positive and negative characteristics that make up their species. Next, the player customizes the empire of their species. In this phase the player chooses the ethics and civics of the empire (with Ethics and Civics points, respectively), which can give various buffs, restrict certain features (a Spiritualist empire cannot use robots, a Materialistic empire cannot get Psionic pops) and governments from being picked (an Authoritarian empire is unable to be a democratic government), and change the way information is presented to the player. Civics can include, originating from a world ravaged by nuclear warfare or starting with a secondary playable race, such as robots or a strong but unintelligent worker race. These secondary species are created in a similar process as previously mentioned. All ethics, other than the later added Gestalt Consciousness, have a normal and fanatic versions which represent the alignment of the empire. Fanatic versions of ethics give greater bonuses than their normal variants, but usually have even higher restrictions and always take up 2 ethics points instead of the normal 1 point per ethic. A special previously mentioned ethic named Gestalt Consciousness makes the empire a hive mind or robotic empire, takes up all ethics points and gives new civics only available to hive mind and robotic empires. Both ethics and most civics can be changed throughout the game. Then, the player customizes the flag, name, homeworld, engineering style and ruler of their empire. The player begins with a single habitable planet in their territory, several mining and/or research stations, a construction ship, a science ship, three small warships, and a starbase. Early gameplay consists of exploring and colonizing space, while mid-game activities focus on diplomacy and governing an empire. In the late game, crisis events can occur that have galaxy-wide implications—for example, an awakening of dormant sentient AI or an invasion by extra-dimensional or extra-galactic forces, the former two always being triggered by careless empires. Paradox hoped that this would address a common late-game problem in 4X style games; whereby one faction is so powerful that their eventual victory is inevitable, resulting in frustrating gameplay. Stellaris was developed by Paradox Development Studios and published by their parent company, Paradox Interactive. The game uses the same Clausewitz Engine that the studio has used since Europa Universalis III in 2007 albeit with some modifications, such as the usage of physically based rendering (PBR). It was officially announced at Gamescom in August 2015. Stellaris was released to the public on May 9, 2016. After launch, the developers confirmed that there would be a number of expansion packs, as well as free updates to address bugs and introduce new gameplay features. The upgrades are named after famous science fiction writers, including Arthur C. Clarke, Isaac Asimov, Robert A. Heinlein, Iain Banks, Douglas Adams, Karel Čapek, Pierre Boulle, C. J. Cherryh, Larry Niven and Ursula Le Guin. The first major patch was released on May 24, featuring numerous improvements to the AI, as well as an additional playable race. The first major DLC, "Utopia", was released on April 6, 2017, including features such as stellar megastructures. The second DLC, "Synthetic Dawn", was released on September 21, 2017, and allows playing as (and against) non-organic empires. "Apocalypse", the third DLC, focused on warfare, and adding features such as planet killer weapons, was released on February 22, 2018. It coincides with the 2.0 (Cherryh) patch, which revamps a significant amount of game mechanics, even for players who have not purchased "Apocalypse". The fourth DLC, "Distant Stars", added a fictional 'L-Cluster' section of stars that spawned with regular galaxies as well as adding more content with anomalies, events and entities. This coincided with the 2.1 (Niven) update which revamped the base gameplay loop of the game, adding more quality-of-life features. The fifth DLC, "Megacorp", allows players to play as a megacorporation. It was released on December 6, 2018, along with the 2.2 (Le Guin) update which revamped how planets are organized. In August 2018, Paradox announced that they were porting the game to consoles. 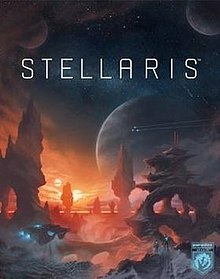 The PlayStation 4 and Xbox One versions of Stellaris were released on February 26, 2019 as Stellaris: Console Edition. Leviathans 20 October 2016 Introduces 'Guardians,' powerful space creatures and entitites which can be fought or investigated; independent enclaves; and new mechanics for Fallen Empires to awaken and either reconquer the Galaxy or fight one another in the "War in Heaven." Utopia 6 April 2017 Utopia adds megastructures including Ringworlds and Dyson Spheres, space habitats, 'Ascension Perks' allowing biological, synthetic or psionic evolution, hive mind empires, new slavery and native indoctrination options and additional civics. Synthetic Dawn 21 September 2017 This expansion features the ability to play as and encounter machine empires with unique event chains and mechanics while also adding synthetic uprisings and new synthetic portraits. Apocalypse 22 February 2018 Apocalypse adds several superweapons providing for the ability to destroy planets and eradicate or assimilate planetary populations, in addition to new 'Titan' ship classes and defensive modules allowing for system-wide weapon attacks. The expansion also includes nomadic 'Marauder' civilisations, unity ambitions and new civics. Distant Stars 22 May 2018 In Distant Stars players will be able to discover and unlock access to new, hidden star clusters and encounter several new anomalies, events, space entities and unique systems. Megacorp 6 December 2018 Megacorp introduces new Corporate Authorities which can establish branch offices on foreign planets and dominate galactic trade, the ability to create an ecumenopolis, non-player nomadic 'Caravaneer' civilizations, more megastructures, new ascension perks and a galactic slave market. In a preview of the game at Rock, Paper, Shotgun, Adam Smith wrote that Stellaris "could be Paradox’s finest hour, and a landmark in the development of both 4X and grand strategy design." At release, Stellaris received favorable reviews, with Metacritic giving it an overall score of 78/100. A number of reviews emphasised the game's approachable interface and design, along with a highly immersive and almost RPG-like early game heavily influenced by the player's species design decisions, and also the novelty of the end-game crisis events. The more mixed reviews also noted that the mid-game could be less satisfying, thanks to an overly simple diplomatic system and a somewhat passive AI. Less than 24 hours after release, Paradox Interactive announced that Stellaris had sold over 200,000 units, breaking the revenue record for any of Paradox Interactive's previous titles during the same time period. It almost matched the sales record currently held by Cities: Skylines. It became Paradox Development Studio's fastest selling game. On 21 June 2016, it was announced that the game had sold over 500,000 units. ^ "Stellaris Confirmed Release Date: May 9th, 2016". Games Ring. Archived from the original on May 3, 2016. Retrieved May 16, 2016. ^ a b Savage, Phil. "Stellaris: how Paradox plan to make an infinite grand strategy". PC Gamer. Retrieved April 8, 2016. ^ a b Smith, Adam (August 6, 2015). "Paradox's Space Strategy Game Stellaris Has Won Gamescom". Rock, Paper, Shotgun. Retrieved April 8, 2016. ^ "The End Game and its Follies". Explorminate. January 15, 2015. Retrieved March 9, 2018. ^ "Paradox Development Studio". Retrieved August 16, 2012. ^ Toll, Fredrik. "Stellaris Dev Diary #2". Paradox Interactive Forums. Paradox Interactive. Retrieved 1 June 2016. ^ Potter, Matt (August 10, 2015). "Gamescom 2015: Paradox Interactive Announces Stellaris". IGN. Retrieved August 27, 2015. ^ "Stellaris Dev Diary #33 - The Maiden Voyage". Retrieved 2018-01-06. ^ "Stellaris Dev Diary #34 - Clarke Patch". Paradox Interactive Forums. Retrieved 2016-06-07. ^ "Stellaris to be First Ever Grand Strategy Game to Land on Consoles". Paradox Interactive Forums. 20 August 2018. Retrieved 21 August 2018. ^ Hall, Charlie (January 22, 2019). "Stellaris: Console Edition arrives in February, the first grand strategy title on PS4, Xbox One". Polygon. Retrieved January 24, 2019. ^ "Stellaris: MegaCorp Available Now!". Retrieved Dec 6, 2018. ^ a b "Stellaris". Metacritic. Retrieved May 13, 2016. ^ "Stellaris". Metacritic. Retrieved March 9, 2018. ^ Bratt, Chris (May 10, 2016). "Stellaris breaks Paradox's record for day one revenue". Eurogamer. Retrieved May 10, 2016. ^ "Paradox Interactive Announces Grand Successes for Grand Strategy Titles" (Press release). Stockholm: Paradox Interactive. June 21, 2016. Archived from the original on September 30, 2017.